When will be Junkyard Empire next episode air date? Is Junkyard Empire renewed or cancelled? Where to countdown Junkyard Empire air dates? Is Junkyard Empire worth watching? In Junkyard Empire, the hunt is on for big, washed up metal-cars, motorcycles, boats, homes, campers and heavy equipment-from police impounds, private auctions, dealers, random driveways or old lots. What might look like a rusted out beater to most people is pure gold in the seasoned eyes of Andy and Bobby as they hunt valuable parts, scrap metal or a potential high-end fabrication for their clientele. Once back at the junkyard its pure hustle-and-bustle chaos as cars are lifted, stacked, torched, stripped and scrapped. At the custom car shop the once ruined cars are brought back to life one panel and plug at a time transforming the trash into treasure for high dollar customers. Andy's new school meets old school Barracuda build keeps hitting setbacks; Dave can't catch a break and morale hits a new low; Tommy's bringing some retro-cool to a junked helicopter; a '71 Chevy Blazer gets a big power boost. When Andy decides to take another crack at the world speed record for tow trucks in his Racing Wrecker, Bobby plans to take him on in a 1979 Zephyr with a hot new engine. Neither expects a third racer to show up with a sleeper that wakes everyone up. Andy Cohen and his dad, Bobby, live by the motto that cars create memories, and they're about to restore a couple of classics. One is a Jeep Wrangler that's an American icon; the other is a 1986 Monte Carlo – once known as "The Heartbeat of America." 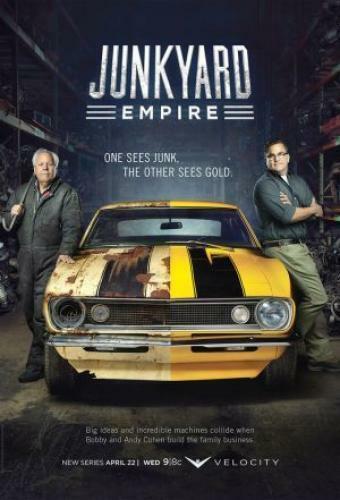 Junkyard Empire next episode air date provides TVMaze for you. EpisoDate.com is your TV show guide to Countdown Junkyard Empire Episode Air Dates and to stay in touch with Junkyard Empire next episode Air Date and your others favorite TV Shows. Add the shows you like to a "Watchlist" and let the site take it from there.